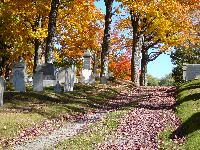 The City of Belfast Cemetery Department is responsible for the maintenance and upkeep of all seven public cemeteries in the City. We have a full-time seasonal crew of employees who are able to assist you in any aspect of lot maintenance. The superintendent is on duty weekly for information and other requests. We offer full-service arrangements for traditional and cremation interments. We take great pride in serving the public in their needs and also have a reputation for excellent care of the grounds. The City of Belfast has seven cemeteries in various locations throughout the City. Residents and non-residents may purchase lots. If you are interested in purchasing a lot, please contact Cemetery Superintendent Steve Boguen at (207) 338-2264.